WASHINGTON (CNN) -- Two top North Korean diplomats were traveling to Santa Fe, New Mexico, to hold talks with Gov. Bill Richardson, the governor's spokesman said. 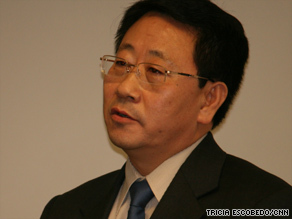 Kim Myong Gil is a senior diplomat with the North Korean mission to the United Nations. Kim Myong Gil and Taek Jong Ho, senior diplomats with the North Korean mission to the United Nations, left New York on Tuesday and are scheduled for a two-day meeting with Richardson, said a U.S. source with knowledge of the visit and a senior State Department official. Richardson, a former U.S. ambassador to the United Nations, has traveled to North Korea several times in the past, most recently in April 2007 to secure the return of remains of U.S. soldiers killed during the Korean War. The U.S. source with knowledge of the visit said that the North Koreans had asked Richardson for the meeting. Richardson would listen to what the North Koreans had to say but would not do any negotiating, the source said. The three will meet at the governor's mansion in Santa Fe for all-day talks Wednesday and then discuss renewable energy initiatives on Thursday, according to Richardson spokesman Gilbert Gallegos. New Mexico is a leader in the United States in exploring renewable energy technologies. The visit comes on the heels of former President Bill Clinton's trip to North Korea to gain the release of two U.S. journalists held in Pyongyang. Obama administration officials had said they hoped the release of Laura Ling and Euna Lee would give North Korea a face-saving opportunity to return to talks aimed at ending its nuclear program. North Korea has said it would not return to the so-called six-party talks with the U.S., South Korea, Japan, Russia and China. The New Mexico trip could signal that the North Korean regime was ready to re-engage with the international community, the source said. "The timing is interesting," said the U.S. source. "It's two days. Interesting things can always be said. And any interesting thing can be passed on to the (Obama) administration." Because of existing sanctions on Pyongyang, North Korean diplomats serving at the mission to the United Nations are limited to travel within a 20-mile radius outside the New York city limits. The North Koreans had asked for permission to travel to New Mexico, and the State Department granted it, a senior State Department official told CNN. "The North Koreans asked for permission to travel and as in the past, we have said yes," the official said. "But we don't know what they want to talk to Bill Richardson about. If the North Koreans want to talk, they know who to talk to. They can come back to the six-party process and tell us if they are ready to move toward denuclearization."